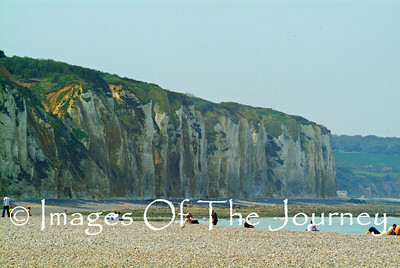 There is a small sea harbour town on the Normandy coast, nestled between towering chalk cliffs. 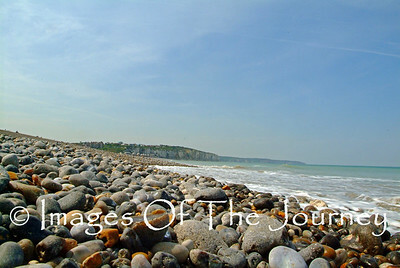 Dieppe is much like any other of the Normandy towns. There is however something unique here, for I have seen a number of times, Canadians, from all walks of life, and ages, kneel down on the beach there and shed a tear and even weep as I did. It is as if the name is branded into the soul of any Canadian who knows any World War Two History. It was here on August 19, 1942 five thousand Canadians and one thousand Brits launched a so called "raid in strength" on the town. At best it was an ill conceived attempt to satisfy Stalin's demands for attacks that would draw German resources and take the pressure off the Russian front at worst it was outright betrayal. Mismanagement is too kind a word for the events of the day. It was a bloody disaster. The bombardment of the guns on the cliffs, by the single cruiser with a single 4” gun, overlooking the beach was woefully inadequate and completely ineffectual. Many of the tanks landed on the beach by the new LCTs (Landing Craft Tank) could not climb the steep flint pebble beach which jammed and broke the sprockets of their tread drive wheels. The men were trapped on the beach, sitting ducks for the overwhelming fire power of the machine guns of the shore defenses and the heavy guns on the surrounding cliffs. By the end of the day, of the 3367 casualties, 907 Canadians were dead, and a further two thousand captured. 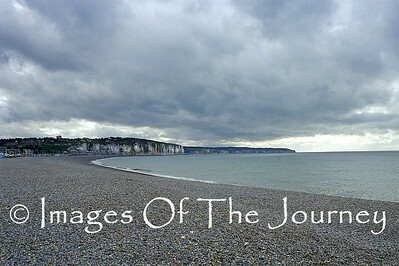 "They" said many lessons were learned that made the D day invasion, two years later, a success. 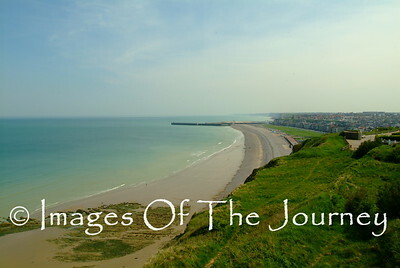 View of Dieppe beach from the German gun positions. The truth is that Stalin was threatening to sue for peace with Hitler on the verge of taking Moscow, Stalingrad, and Leningrad. Not only that but Roosevelt did not like Churchill's plan to go to North Africa first. He wanted to take on Hitler in France right away. Churchill gave Mountbatten the job of mounting a mini invasion.... and prove it could not be done.... yet. (source Gen. Denis Whitaker in his book Dieppe Tragedy to Triumph) So the bombing of the massive cannons on the cliff tops, by Bomber Harris, was called off at the last minute, no battle ship was sent to provide fire support and the Canadians were slaughtered. As solace each man found that his water bottle had been filled with Navy Rum instead of water. 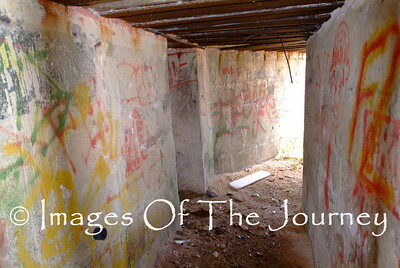 Underground passageways connecting German Positions. 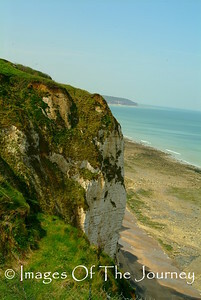 The chalk cliffs bordering both sides of Dieppe beach. There are many small caves in which the Germans had mounted machine guns. On the top of the cliffs they had large artillery pieces. 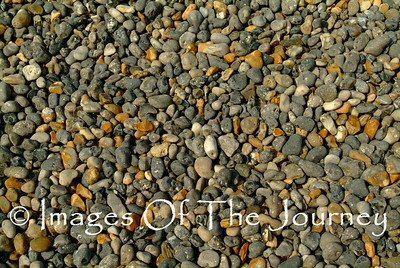 The beach is mostly Chert (flint) stone. At night if you throw a stone on to the beach you get a shower of sparks. This was first time here and as I walked through the Canadian cemetery that day, I realized I was the only Canadian alive among the seven hundred and eighty there around me. Row after row of them lay silently under the perfectly manicured lawn and gardens. Incongruously a small dog followed me, eager to play, nipping at my sandled toes, oblivious to the folly of men. 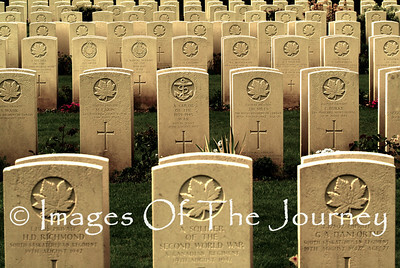 I read the inscriptions beneath the maple leaf on each stone. Messages of hope in the afterlife, records of heroism, and one compelling request: "He sleeps beside his comrades. His Grave I may never see. May some kind hand place a flower for me." I found a flower and with tears in my eyes, did as I was asked. I did not notice the approach of a man about my age and two women. One of the women was in her late seventies. They saw me looking intently at the grave. "Bonjour, le connaissez vous? "Non" I said, pointing to the inscription. He nodded. "Ah oui. We wonder..we bring ma mÞre to visit her first loves tomb." "She was Canadian, from Quebec before the war. After the war she moved here so she could be near him." "Mon nom est David." I said " Je m'appelle Nicholas, over there is my wife and my mother. You have come a long way to visit a cemetery in which you know no one." "Oui, Dieppe est trÞs important pour les Canadiens" Between his "terrible English" and my questions in "mauvais Franþaise", he told his mother's story. She had fallen in love with a Canadian soldier. He had written to her every day describing his life in England. Then the letters stopped. His last letter was dated August 17, 1942. A few weeks later the telegram arrived at his family home "We regret to inform you...". 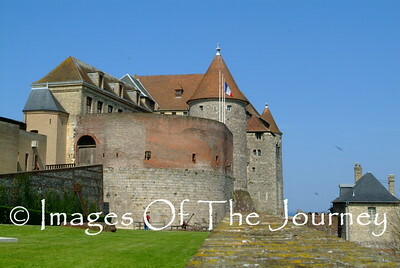 After the war, she emigrated to France. One day in this cemetery she met a French soldier come to pay his respects to the Canadians who had given their lives to free his country. He had escaped France at the Dunkerque evacuation. They talked until the sun had set and he asked if he could drive her home. A year later they were married. "That was my father." Nicholas said "He died last year." I was reminded of a passage in the Bible. "As for man, his days are like grass, he flourishes like a flower of the field; the wind blows over it and it is gone, and its place remembers it no more." 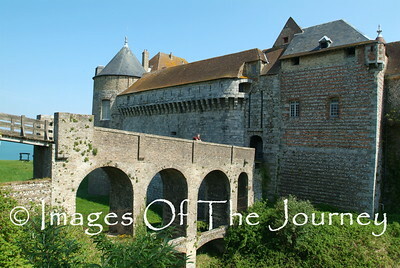 Nicholas asked, why had I come to France? I could have answered that I had been fascinated by WW II since I was a teenager, but at that moment I realized there was more to it than curiosity. I told him that I didn't know -yet. With that we parted, four people connected by a cemetery, grief and an intense hatred for war.